Kids at Your Wedding? Keep Them Happy and Busy. Make a lovely personalized wedding favor for young guests by designing your very own custom wedding coloring book. Create a memorable wedding favor keepsake for the younger members of your wedding party and for children who attend your rehearsal, shower or ceremony. Want to know a secret? Adult guests will enjoy this crafty favor, too. 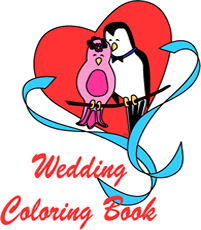 A keepsake wedding coloring book with personalized cover and pages you've chosen for the inside will entertain little artists at the party and keep them busy for at least a few minutes during the "boring grownup activities." Making your own wedding booklet favors is easy. Print a collection of wedding coloring pages, (or choose designs that go along with your wedding theme) design a front and back cover (use our printables at left and add personalization with your word processor or by hand), stack up the pages and punch holes along the edge and thread together with ribbon or staple the whole thing together. Package the kids craft booklets in a gift bag or tote along with colored pencils, a sharpener, an eraser, stickers and a packet of tissues to keep things neat and tidy. For older children, add puzzles such as mazes, Sudoku, work search, crosswords and match word games made up with names in the wedding party or family and friends. Project Wedding DIY Challenge: Activity Books for Kids - get detailed instructions for making these favors for youngsters at your wedding reception.